Symbol of quality and differentiation, PDO Aceite de La Rioja protects the oil produced in the Region of La Rioja, where the olive tree plantations date back centuries. Made with fresh fruits, grown according to traditional practices and collected using modern techniques, the liquid gold enjoys an exceptional quality. Olive oil with Designation of Origin is the result of the work by makers from La Rioja, and the use of modern systems of production and growth. With an annual production of 650.000 liters, the oil is sold under 70 brands that enjoy great national and international recognition. Fruity with very peculiar and slightly bitter flavor notes, the oil of La Rioja has very different characteristics. The distinction is acquired from weather conditions and the type of soil in the region. Rioja´s liquid gold takes the consumer to a world of sensations that make the product a culinary gem. Slathered on toast is a delicious dish; as on vegetables and salads, customizes each dish with a distinctive flavor; and used to fry food, it offers many advantages over vegetable oils. A Flagship of the Mediterranean diet, the virtues of Rioja´s oil surpass the gastronomic barriers. With high levels of oleic acid, its consumption has a positive effect on health. Nutritionists recommend it as one of the pillars of nourishment for its contents of monounsaturated fatty acids and antioxidant properties. 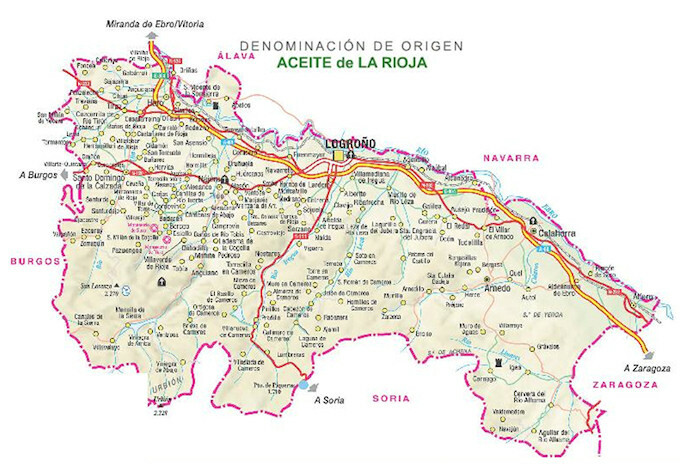 Geographical area: the Region of La Rioja formed by shire of Rioja Alta (High Rioja), Rioja Media (Medium Rioja), Rioja Baja (Lower Rioja), Sierra de Rioja Alta (High Rioja Mountain Range), Sierra Rioja Media (Medium Rioja Mountain Range) and Sierra de Rioja Baja (Lower Rioja Mountain Range). Varieties: redondilla or redondal, arbequina, empeltre, macho or machona, negral, royal or royuelo, hojiblanca, arróniz, verdial, picual, cornicabra, manzanilla and blanqueta. The use of transgenic varieties is forbidden. Only under experimental basis, arbosana, koroneiki, chiquitita and frantoio are approved. Establishment date: 8th october 2004. Registered olive farmers: 800 olive farmers. Registered olive factory makers: 14 olive factory makers. Annual production: 650.000 olive oil liters. Olive oil characteristics: they have very different organoleptic characteristics. They are fruity with peculiar and slight bitter aromatic notes. Acidity less than or equal to 0,8. Ultraviolet absorbency (K270), less than or equal to 0,20. Peroxide value mEq O2 / kg under 15. Moisture and volatile matter at 105ºC less than or equal to 0,2 per 100. Insoluble dirt in petroleum ether, less than or equal to 0,1 per 100. Defect Medium Sensory evaluation (Md), Md = 0. Fruitiness Average Sensory evaluation (Mf), Mf greater than 0. Managing body: Control Board of PDO Aceite de La Rioja. Control Body: Quality department of the Ministry of Agriculture, Farming and Environment. Certification body: Quality Section of the Ministry of Agriculture, Livestock and Environment.